[15-Feb-19] In developing nations where floodwaters cross borders, the loss of life from dam-driven flooding underscores the urgency of making information on upstream dams more accessible to citizens. 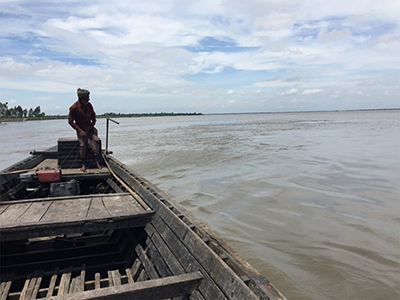 To improve timely access to upstream reservoir information in transboundary river basins of the Red and Mekong rivers, Vietnam recently launched a satellite-based operational system. This article describes the key steps to building such a transboundary dam monitoring system for water agencies of developing countries. [02-Jan-19] SWOT is scheduled to map the entire globe between 78° north and south latitude over the course of 3 years. Before it settles into its main orbit, covering Earth's surface every 21 days, the first 90 days of the mission will be flown in a "fast-sampling" phase, revisiting each area once daily. Ocean scientists are invited to contribute ground-based measurements to compare with the satellite data. [17-Oct-18] A device built in the UK by Honeywell, which will form a vital part of the mission to make the first global survey of the world's surface waters and oceans, has been delivered to Thales Alenia Space in France. The UK-built device, known as a duplexer, is a vital component that routes radar signals around the Surface Water and Ocean Topography (SWOT) satellite. The duplexer will be integrated into a Radio-Frequency Unit by Thales Alenia Space before NASA engineers add it to the KaRin instrument developed at the Jet Propulsion Laboratory (JPL) in California. [26-Sep-18] Two of NASA's recently awarded Earth Venture science investigations are highly relevant to SWOT. Marc Simard (JPL) is spearheading an investigation to better understand the natural processes that maintain and build land in major river deltas threatened by rising seas. Thomas Farrar (Woods Hole Oceanographic Institute) will lead an ocean campaign 200 miles off the coast of San Francisco designed to explore the potentially large influence that small-scale ocean eddies have on the exchange of heat between the ocean and the atmosphere. [01-Aug-18] Water volume cannot currently be measured directly from space. The Surface Water and Ocean Topography (SWOT) mission, planned for launch in 2021, intends to provide a major improvement in the availability of surface extent and storage change for surface water bodies such as lakes, reservoirs, wetlands, and rivers globally. With SWOT data, water volume, and river discharge can be more easily estimated. [26-Jul-18] The SWOT mission is being jointly developed and managed by NASA, the French Space Agency (CNES), and the Canadian Space Agency, with contributions from the United Kingdom Space Agency. It is UK-based Flann Microwave's first project for NASA, and has seen engineers working closely with their counterparts at NASA's Jet Propulsion Laboratory (JPL), in Pasadena, California, in developing custom-made waveguide equipment. [28-Jun-18] Hydrologist George Allen (Texas A&M University) and SWOT Hydrology Science Lead Tamlin Pavelsky (University of North Carolina at Chapel Hill) used a statistical model to determine that global river and stream surface area is about 45 percent greater than indicated by previous studies. The findings, published in the journal Science, may change our understanding of the importance of streams and rivers in exchanging greenhouse gases with the atmosphere. [07-May-18] Floods are one of the most common and devastating of Earth's natural disasters. A new study at NASA's Jet Propulsion Laboratory analyzes what it would take for river-observing satellites, such as SWOT, to become powerful tools for predicting and mitigating flood impacts. [06-May-18] Following the successful critical design review at the end of 2017, Thales Alenia Space announced that it has reached new milestones in the construction of the SWOT satellite. Thales Alenia Space is developing the Radio Frequency Unit (RFU) for KaRIn (Ka-band Radar Interferometer), and the Poseidon dual frequency altimeter for the NADIR module. [21-Feb-18] Study suggests that upper-ocean small-scale turbulence transports heat upward in the ocean at a level five times larger than larger-scale heat transport by ocean eddies, significantly affecting the exchange of heat between the ocean interior and atmosphere. Such interactions have a crucial impact on the Earth's climate. [03-Jan-18] Hook Hua was awarded the Charles S. Falkenberg Award at the American Geophysical Union Fall Meeting Honors Ceremony, held on 13 December 2017 in New Orleans, LA. He has been instrumental in leading JPL's cloud computing efforts, which are being applied to the SWOT mission. [13-Dec-17] SWOT Investigator, Dr. Faisal Hossain, is collaborating on a project that would allow hydroelectric dam operators in the Mekong River Basin (Southeast Asia) to generate power while protecting food supplies and businesses. This approach could be applied to other large river systems around the world. [02-Nov-17] The resilience of coastal communities depends on an integrated, worldwide coastal monitoring effort. Satellite observations, like those that will be made by the SWOT mission, provide valuable data on global to local scales. [20-Oct-17] This survey is designed to help quantify user requirements on the SWOT data distribution and archive system hosted by JPL through PO.DAAC in support of science and applications users. [19-Sep-17] In April 2017, representatives of stakeholders dealing with water issues in a decision-making capacity attended a workshop to explore how best to maximize SWOT's user readiness after launch. Key observations and recommendations for the mission are summarized here. [07-Aug-17] NASA is using Saskatchewan's wetlands and the North Saskatchewan River as a testing ground for new water mapping technologies. Researchers say that the area of Prairie potholes - thousands of tiny wetland lakes formed by glaciers - around the Saint Denis National Wildlife Area and Redberry Lake, and the North Saskatchewan River near the Petrofka Bridge, offer the ideal locations to study and test AirSWOT. [26-Jul-17] The Surface Water and Ocean Topography (SWOT) satellite mission aims to change how we assess freshwater export from rivers. One mission objective explores a novel alternative approach that uses remote sensing data to estimate river fluxes. Combining satellite observations with algorithms borrowed from river engineering have the potential to fill large gaps in our knowledge of global river flows - especially in areas where field data are lacking. [22-Nov-16] NASA has selected Space Exploration Technologies (SpaceX) of Hawthorne, California, to provide launch services for the agency's Surface Water and Ocean Topography (SWOT) mission. Launch is targeted for September 2021 on a SpaceX Falcon 9 rocket from Space Launch Complex 4E at Vandenberg Air Force Base in California. NASA's Launch Services Program at Kennedy Space Center in Florida will manage the SpaceX launch service. [13-May-16] Only about 3 percent of the nation's 80,000 dams are currently equipped to generate electricity. And although not all of the nonpowered dams are suitable for energy production, the best and easiest way to promote "green" energy could be to go "blue" - to add hydropower to as many of the existing dams as possible, along with canals and other overlooked water infrastructure - Robert L. Reid. [26-Mar-16] General recommendations for globalization of EO-based applications and capacity building. [16-Dec-15] Climate change is rapidly warming lakes around the world, threatening freshwater supplies and ecosystems, according to a new NASA and National Science Foundation-funded study of more than half of the world's freshwater supply. [20-Nov-15] Surface water storage and fluxes in rivers, lakes, reservoirs and wetlands are currently poorly observed at the global scale, even though they represent major components of the water cycle and deeply impact human societies. In situ networks are heterogeneously distributed in space, and many river basins and most lakes - especially in the developing world and in sparsely populated regions - remain unmonitored. Satellite remote sensing has provided useful complementary observations, but no past or current satellite mission has yet been specifically designed to observe, at the global scale, surface water storage change and fluxes. This is the purpose of the planned Surface Water and Ocean Topography (SWOT) satellite mission. [19-Oct-15] Satellite remote sensing offers a unique global observational platform for pursuing societal benefits in ways that are not feasible using only conventional ground-based approaches. Reaping these benefits requires an intimate engagement between the scientific community and a wide range of stakeholders. [29-Jul-15] Four researchers from the SWOT Science Definition Team have been elected to the highly competitive AGU Fellows program. [29-Jun-15] This video describes the agenda of BanD-AID, a team of inter-disciplinary scientists and engineers working hand in hand with the stakeholders, to achieve large-scale impact on a region. The message that is shown here is that with active two-way feedback from beneficiaries in the design of research investigations, science can reach its highest potential in serving society on a faster timeframe. [19-Jun-15] In a proof-of-concept modeling study, Munier et al. investigated the potential for using water level data from the upcoming Surface Water and Ocean Topography (SWOT) mission - a collaboration between NASA and Centre National d'Etudes Spatiales - to more effectively manage water resources in Mali's Upper Niger River Basin. [17-Jun-15] In the near future, NASA and CNES, the French space agency, will debut a new satellite that many researchers believe could be a game changer in understanding and managing Earth's greatest resource: water. SWOT - short for Surface Water and Ocean Topography - will "see" 90 percent of our planet and provide the first global inventory of its surface waters. 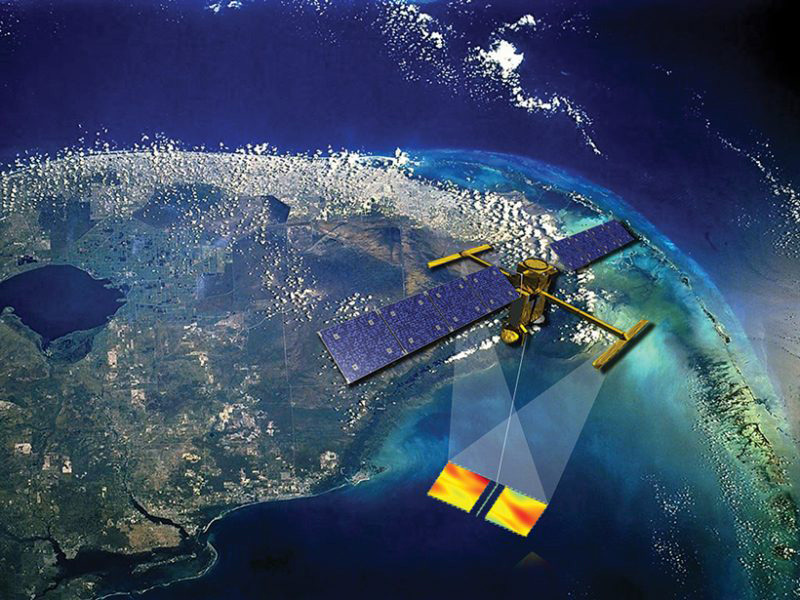 [06-May-15] NASA's Surface Water and Ocean Topography (SWOT) satellite is set to make a first-ever global survey of Earth's surface water by collecting detailed measurements of how bodies of water change over time. [06-Jan-15] The French space agency, CNES, has signed the first of three planned contracts for the U.S.-French Surface Water and Ocean Topography (SWOT) satellite, a mission in which the two governments plan to invest some $1.1 billion for a launch in 2021. [18-Aug-14] Canada, through the Canadian Space Agency (CSA), is investing in Canadian innovation that will play a key role in the first-ever global survey of surface water. [02-May-14] NASA Administrator Charles Bolden and CNES President Jean-Yves Le Gall signed an agreement to move from feasibility studies to implementation of the Surface Water and Ocean Topography (SWOT) mission. [22-Apr-14] President Obama named UNC-Chapel Hill Geological Sciences Assistant Professor Dr. Tamlin Pavelsky as a recipient of the Presidential Early Career Award for Scientists and Engineers (PECASE). The PECASE awards represent the highest honor bestowed by the U.S. government on scientists and engineers beginning their research careers. [19-Mar-14] The frustrated attempts of a UCLA graduate student to quantify the amount of water draining from Greenland's melting ice sheet led him to devise a new way to measure river flows from outer space. This new approach relies exclusively on the measurements of a river's width over time, which can be obtained from freely available satellite imagery. [06-Feb-14] The UK Space Agency and France's Centre National d'Etudes Spatiales (CNES) have agreed a deal to work more closely on space projects. This agreement includes the CNES/NASA project on global fresh water distribution, which is being designed to conduct the most comprehensive global survey of Earth's surface water using the Surface Water and Ocean Topography (SWOT) satellite. [13-Sep-13] This video, created by NASA/JPL's PODAAC, illustrates the evolution of ocean altimetry satellite data beginning in 1978 with the first Earth orbiting ocean observing satellite, Seasat, and continuing with the Geosat, ERS-1,TOPEX/Poseidon, ERS-2, Jason-1, Envisat and Jason-2 missions. [13-Sep-13] This special issue highlights over 20 years of progress in dealing with both fresh and marine transboundary water issues, with a special focus on the importance of science in sustainable management of transboundary water systems. [07-Jun-13] When you think about NASA, water probably isn't the first thing that comes to mind. But NASA knows that access to fresh water and the impacts of climate change will be two of this century's biggest challenges. Their ongoing AirSWOT mission - a partnership with the French and Canadian space agencies - will help to improve our understanding in both of those areas. [09-Apr-13] Dr. Faisal Hossain, an Associate Professor at Tennessee Tech University, a member of the SWOT Science Definition Team, and a Fulbright Scholar experiments with an alternative approach to illuminating a deeper meaning and societal relevance of the science outcomes of satellite data. [06-Mar-13] A mission to map Earth's water from space starts with a small passenger plane flying over California's Sacramento River. Such flights are helping scientists fine-tune a precision radar system called AirSWOT (Air Surface Water Ocean Topography), which will fly aboard the SWOT satellite planned for launch in 2020. [16-Jan-13] Testing for the calibration and validation of AirSWOT (an airborne platform-based test instrument) will begin in 2013. The SWOT mission has requested that the US Geologic Survey (USGS) California Water Science Center assist with field measurements during its AirSWOT's pilot flights. [14-Jan-13] A long-term cycle of too little water from melting snow and rain to counter the effects of evaporation has caused water levels in Lakes Michigan and Huron to fall to record low levels. There's too little data to say the problem is a product of global warming, but it's a cycle that's been seen before. [11-Dec-12] Dr. Faisal Hossain, currently working in Bangladesh on a Fulbright Faculty Award, received the 2012 Charles S. Falkenberg Award at the AGU Fall Meeting Honors Ceremony, held on 5 December 2012 in San Francisco, Calif.
[20-Nov-12] In the Fall of 2012, SWOT passed two important milestones and has now entered Phase A in the NASA mission development lifecycle. The milestones are common to all NASA satellite missions and include the Mission Concept Review (MCR) and Key Decision Point A (KDP-A). [20-Jul-12] A vision for a sustainable future by Dr. Jay Famiglietti, University of California, Irvine. [16-Feb-12] Multiple aircraft and specialized instruments, including several from JPL, will operate in the United States, Europe, Asia and South America this year in support of studies conducted by NASA and the Earth science community, improving scientists' understanding of our planet. [19-Apr-11] Wide-swath altimetry technology will provide the first global pictures of the strong surface flows associated with temperature and salinity fronts at the surface of the ocean. [23-Mar-11] The Franco-American Surface Water Ocean Topography (SWOT) satellite, tentatively scheduled for launch in 2019, has been given a grant of 170 million euros. CNES President Yannick said NASA, which is paying two-thirds of the project's total cost, has estimated the entire SWOT mission will cost nearly 700 million euros, including launch and operations. [08-Aug-10] For the first time, scientists have been able to measure the amount of water that rises and falls annually in the Amazon River floodplain. The result - 285 billion metric tons, or 285 cubic kilometers of water by volume - sounds like a lot. That amount is over half the volume of Lake Erie, which is the world's 15th largest lake. 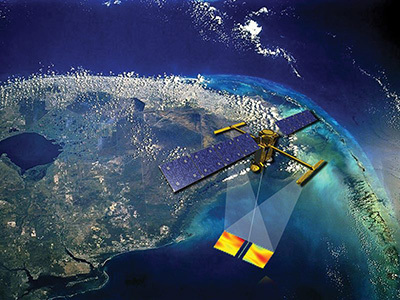 [01-Jul-10] The Surface Water and Ocean Topography mission (SWOT) will launch in 2020. [14-Oct-08] Building a satellite they hope will be able to scan the globe and assess the amount of fresh surface water, space scientists are first focusing on the Sacramento River in Redding. The National Aeronautics and Space Administration scientists are trying to perfect a radar system that will map what's water and what's not. To test the equipment, they're using Redding's three pedestrian bridges across the river - and the variety of rippling, raging or smooth water below them. [13-Oct-08] NASA scientists are spending time in Redding. For the next week and a half, scientists will be at the Diestelhorst and Sundial Bridges working on the Surface Water Ocean Topography Mission. [07-Jan-08] Water flow in wetlands is complex and not easily confined, unlike river channels with well-defined banks. This complexity is best measured from a satellite with two-dimensional elevation mapping capabilities. This image, featured on the AGU homepage in January 2008, was derived from Alsdorf et al. (2007, Figure 1). [19-Jun-07] New satellite technology aims to measure water around the globe. [24-May-07] If you need more precise measurements of natural events on Earth's surface, get into space. Researchers studying glaciers and earthquakes have for some time followed this principle, exploiting the power of satellite interferometric imaging to map surface displacements down to the centimetre scale.